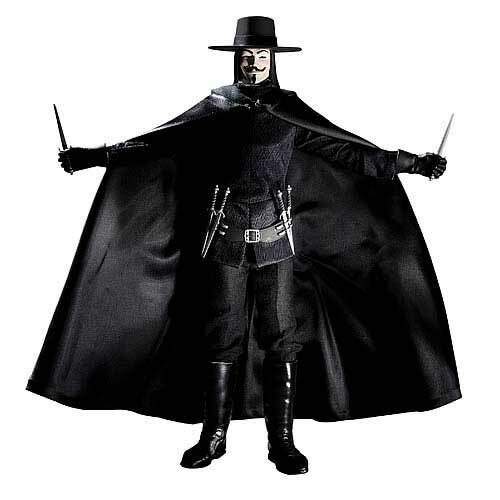 The truth is, the above photo of the DC Direct 1:6 Scale V for Vendetta (12″) Action Figure doesn’t do this awesome collectible justice. Produced in 2009 via a limited run (of how many I don’t know), this collectible is now reasonable hard to find because it is very, very cool. Victim and villain, V voices the frustration and innate power of the people, the true values held precious by the masses. A provocative and disturbing modern classic, the film V for Vendetta is the visually powerful story of a dystopian not-too-distant future. This is a DC Direct produced Limited Edition prop replica of Wonder Woman’s Tiara, Bracelete and Earings. Rare and hard to get, this unit is available by private sale from a private collection. The seller advertises it is in very good to near mint condition with zero defects or dust damage. Hand painted cold-cast porcelain prop set. 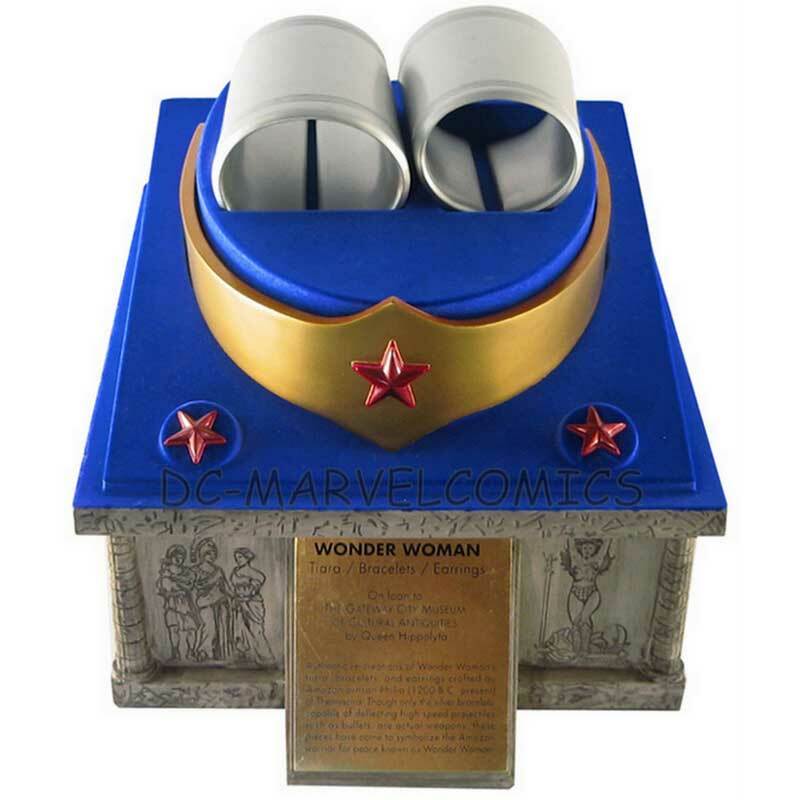 Wonder Woman’s bracelets, earrings and tiara mounted on a display base. Base features images of Wonder Woman and the Amazons. The top of the display base can be removed as can the props. The inside of the bracelets are inscribed with the Amazon code. Display base measures approx 6 1/4″ high x 8 1/2″ wide by 9 1/2″ deep and comes with a removable lid. Tiara measures approx 2 1/2″ high by 7 1/4″ deep. Bracelets measure approx 3 5/8″ long by 2 7/8″ high by 2 1/4″ wide at the wrist. Earrings measure approx 7/8″ in diameter. We are a nation of women, dedicated to our sisters, to our Gods and to the peace that is humankinds right. Granted life by Gaea, the Goddess and the souls of women past, we have been gifted with the mission to unit the people of our world with love and compassion. We are the Amazons and we have come to save mankind. (Bracelet 2) Man has corrupted many of the laws our Gods set forth. So in their wisdom the Goddesses did decree a race of female warriors. Dedicated to the ideals of uniting all people, all sexes, all races, all creeds, no longer will man rule alone. For now woman stands as an equal to temper his aggression with compassion, lend reason to his rages and overcome hatred with love. We are the Amazons and we have come to save mankind. Here’s a chance to get an original limited edition cold cast porcelain statue of The Man of Steel. 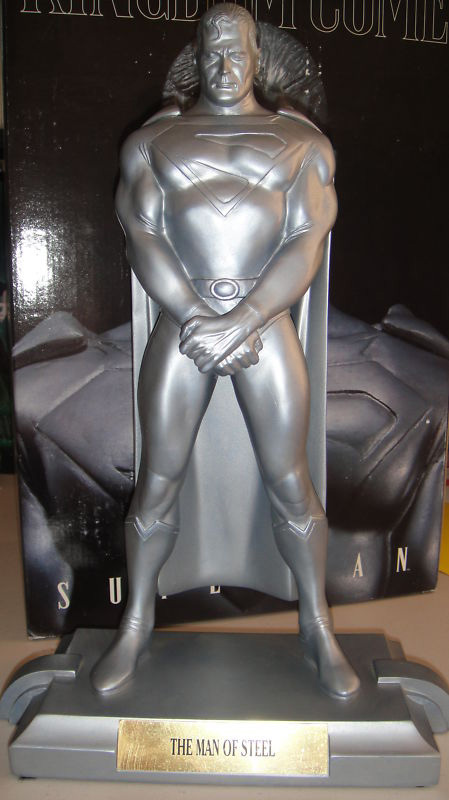 Originally releasedin 1998 by DC Direct, this monochromatic statue of Superman based on the Kingdom Come storyline was designed and sculpted by artist Alex Ross. It’s a highly prized Superman collectible. The one in the image above is the one that’s gone up for sale. It’s numbered #2921/5000 and the seller claims it is in flawless condition. Each statue is individually numbered and is also individually autographed with a 4-color 8 1/2″ x 11″ print of Ross’ preparatory sketch (in an envelope).